The Vivosaurs are far from extinct as Nintendo announces the return of the Fossil Fighters series with the upcoming Super Fossil Fighters on the DS. In the RPG sequel, players continue to find and clean up various fossil pieces and by using them to create and revive the Vivosaurs, enter them into the fossil park-sanctioned tournament. Much like the gameplay style of Pokémon games, fighters gather to compete as combatants discover who the best fighter is. Players excavate and clean fossils. New Giant Fossil Rocks (containing complete Dinosaur fossils) and Odd Fossil Rocks (which are two-sided) add to the fun of the cleaning process. Once the fossils have been cleaned, they can be revived into Vivosaurs, which players can then arrange into teams for battles. The better the fossils have been cleaned, the more powerful the Vivosaurs are in battle. Strategy is key in battles. Players must put forth teams of three Vivosaurs, then rotate their positions to maximize their power advantage over opponents. New “Super Evolver” Vivosaurs evolve into new forms with the help of golden fossils. Players can compete in matchmaking battles or upload their best team to see how it fares against others. Players can also download additional Vivosaurs and events. 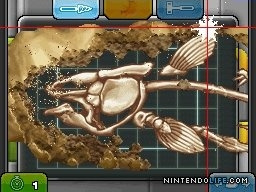 Using DS Download Play, one player who has the game can link up wirelessly with another Nintendo DS owner within range so both can cooperate to expertly clean fossils together. Super Fossil Fighters is developed by Red Entertainment and ARTDINK and will be published by Nintendo in time for this holiday season. Ah, Red Entertainment! The guys who did Nostalgia and Thousand Arms. This looks REALLY nice for a DS game. Awesome! Will probably be picking this one up. Glad to see the DS isn't getting completely abandoned by Nintendo just yet. When I saw this announced awhile ago for Japan, I thought this might be one that Nintendo would localize in the "post-3DS" era. Glad to see Nintendo is still choosing to put out a few games for the old standby. Wowee. Really impressive for DS. Yay~!! I really love that game. They evolve this time around. Its going to be epic~!! Super Fossil Fighters sure looks A LOT better than the first one!! Yes! After hearing about a Japanese release months ago, I didn't think NOA would be localizing it. This is a MUST buy for dinosaur loving gamers such as myself!... Now i just wonder when its coming out. I much prefer battling and throwing Pokéballs to get new monsters over archeology. Otherwise, they've basically ripped off Pokémon at every stage, even stealing Black/White's rotation battles. @ 10.- Fossil fighters had the rotation style combat b4 pokemon black/white was made. Fossil fighters started out with it, and was made about 2 years b4 pokemon black/white got released.